FOR most people the show is the kind of excitement that happens only once a year, but for a hard-working few, it's life. Maureen Chambers was born into the show life and 66 years later, it's all she's known. Now semi-retired the pace has slowed a little as Maureen and her husband spend more time at home in Brisbane. Gone are the days of more than one different town each week, these days the couple spend about 30 weeks a year on the road, travelling to shows and rodeo's from Mt Gambier in South Australia to Broken Hill and as far as north Queensland. 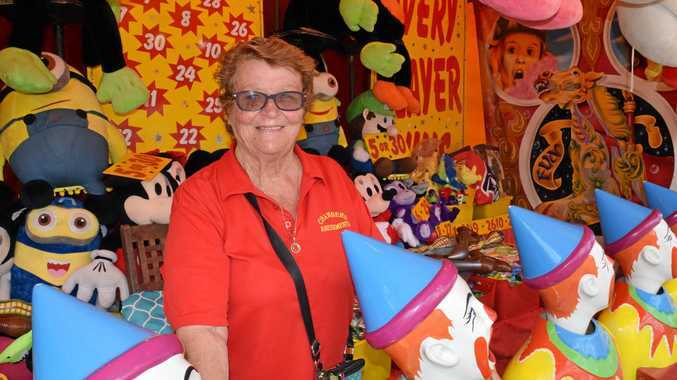 This weekend, Mrs Chambers is the smiling face behind a row of smiling faces, where hopeful punters drop a ball into the mouths of clowns hoping to win a prize. Everybody does however, from a small toy to a gigantic teddy-bear and it's the joy on the kids faces that Mrs Chambers said she loved the most. "It's a great life," she said. "I get to meet so many wonderful people, all out to have a good time and enjoy some good old-fashioned fun. "How can you go wrong." As a child, Mrs Chambers said her life was different to all the other kids. "Every week I'd be a different school," she said. "That was the only part I didn't like. "You couldn't make friends very easily, but the rest of the life was so much fun for a little girl - I still love it. "I don't need to be doing it any more, I only do it because I love the life and I'm surrounded by a close-knit group of old show-people friends." Mrs Chambers has seen a lot of changes to the show circuit over the years. "For a start it's not two bob for a game any more," she said. "Everything is a bit more expensive but the kids still love it. "And the rides are a lot bigger and better. "Make sure you come past and say hello."